A new study from the BioMotionLab just appeared in the journal Evolution and Human Behavior. 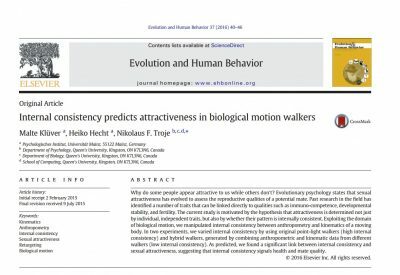 We look at different features that contribute to the perception of sexual attractiveness of another person depicted as a point-light walker that consists of 15 moving dots. The representation is rich enough to convey both the individual, idiosyncratic characteristics of a person’s movements and information about individual body shape.Isolating the two, we measured the attractiveness of individual movement styles as well as individual body shapes. Then, we can recombined movement and body shape in different ways to create hybrid walkers that contain movement of one person and the shape of another person. The question is whether the attractiveness of the pieces predicts the attractiveness of the whole.It does to some degree. But more important is the finding that attractiveness also depends on internal consistency, that is, whether movement and shape match each other or not. Hybrid walkers are rated less attractive than the original walkers which contributed to the hybrid. Our visual system is a sensitive “lie detector” which responds to even the slightest inconsistencies and perceives them negatively.The finding has methodological implications and calls for a re-interpretation of plenty of earlier research which looked at attractiveness in a rather piece-meal way. But it also can be used to formulate advice to people who work on improving their own appearance: Be careful! What works for one person doesn’t work for another one. If in doubt then just be yourself.